In the fields below, add the length, width, and height of each sink compartment in inches. Add a compartment by pressing the "+ Add Compartment" button. A 3-compartment sink requires a different line for each compartment or bowl. Add a Sink Compartment for each separate compartment in each sink. For example, for a 3-compartment sink, add three compartments and put the dimensions of each compartment into the fields for length, width, and height. If you have another sink, add additional compartments for this sink and type in the measurements as well. For flow rate of Dishwasher, please see dishwasher documentation. 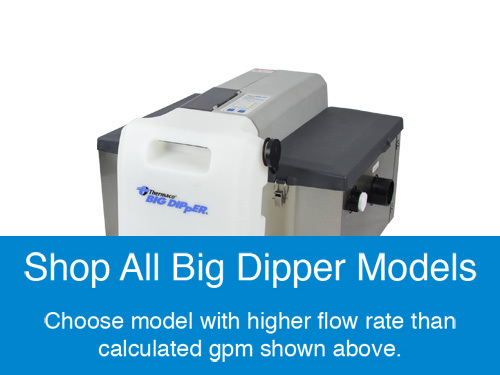 Average Dishwasher Flow is 9 GPM. Thermaco does not recommend connecting a dishwasher to point-source grease interceptors such as Big Dipper. 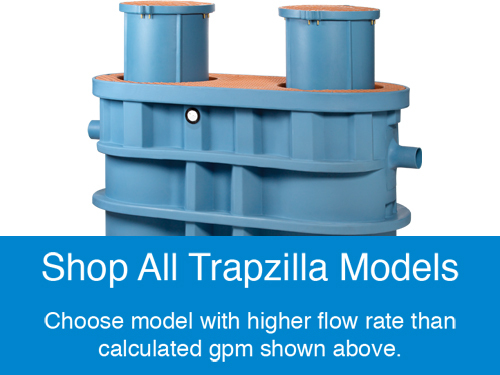 Dishwashers may be connected to Trapzilla Grease Interceptors without issue. *Thermaco does not recommend connecting a dishwasher to Point Source Grease Interceptors such as Big Dipper. If a Big Dipper is to be used, Thermaco recommends connecting the dishwasher to a separate interceptor. Dishwashers may be connected to Trapzilla Grease Interceptors without issue. Already know which grease trap you need?